I always like to get creative with my costumes but had never done a pop-culture costume. I've been a Taylor Swift fan for a few years and loved her first single off her newest album. When the music video for "Look What You Made Me Do" dropped and I saw all the costumes I knew I wanted to channel her this year. After looking through all the options, the diamond filled bathtub seemed the most challenging and I knew there wouldn't be many others trying to pull this look off. 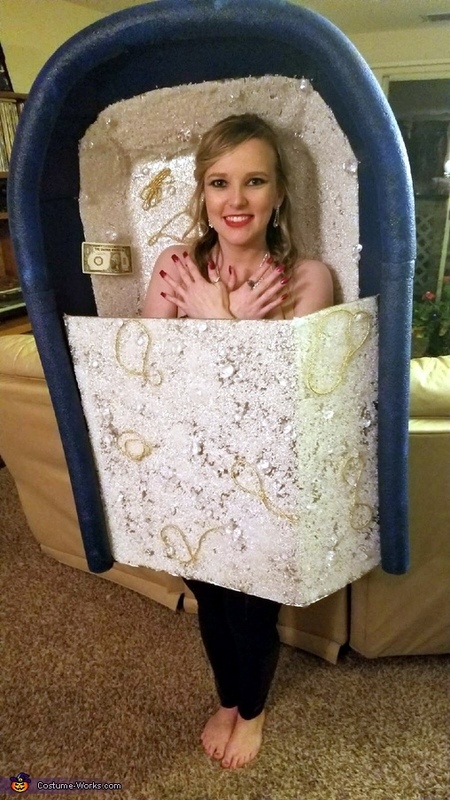 The materials used to make this include paper boxes, cardboard scraps, two inch masking tape, two pool noodles, fishing line, blue spray paint, tin foil, spray adhesive, vase fillers, gold ribbon, hot glue, an old purse strap and a fake dollar bill. The main structure was made by using disassembled paper boxes, cardboard scraps and the masking tape to create the bathtub silhouette. Once that was assembled, I cut half way through two pool noodles lengthwise and tried a few different adhesives to secure them around the edge. In the end I had to sew them to the cardboard using fishing line. Next, I added two coats of spray paint to the entire structure and used the spray adhesive to attach tinfoil to the front panel as well as the inside to form a sort of waterline. Once the foil was secure I used the spray adhesive on the tinfoil and spread the vase filler over it in a thin layer. After a few hours of drying I shook off the extra vase filler and would fill in the gaps. This part took the longest and I worked over four or five days to get most of the foil covered. Once the vase filler was covering the foil and set, I added a final layer of spray adhesive on top to secure any loose pieces. Next, I used hot glue to add the larger vase filler resembling fake diamonds. I focused on filling in any larger gaps and spreading the filler as evenly as possible. I then added the gold ribbon in different designs to look like the gold chains. Next, I had to attach the front panel and strap to wear this costume. The edges of the inside panel folded inside the bathtub structure. I then placed the strap in the appropriate spot inside and a small pieces of scrap wood over it and drilled a screw through the outside into the wood and repeated this on the other side. The final step was to try on the costume and get the placement of the dollar bill correct, just off my right shoulder. Overall it took about 30 hours to create this costumer start to finish.